The Late Ceramic refers to the period of time shortly before and after the arrival of Europeans in the New World. Sites of this period occasionally yield a few artifacts of European origin and often contain evidence of trade with the American Southwest. Many of the Late Ceramic Indian sites in Kansas can be identified with historically known tribes such as the Pawnee, Kansa, Wichita, and Apache. Most of these groups made a living by a combination of bison hunting and agriculture, although some western Plains tribes were more nomadic than the village-dwelling groups of central and eastern Kansas. Two factors contributed to significant cultural changes: the introduction of European trade goods, which began to replace native-made items, and the horse. The Historical Society has conducted extensive excavations of sites of this period and curates large artifact collections. This Great Bend Aspect ceramic pot was recovered in many pieces from an excavation at the Larcom-Haggard site in Cowley county. A culture that shares many characteristics through space and time is called an Aspect. Multiple views of a tiny rabbit effigy recovered from the Radio Lane site in Cowley county. The highly detailed effigy was incised out of hematite, a soft iron ore that can be carved. These iron arrow points were made for trade with American Indians. The larger one may display the manufacturer's mark. They were recovered from Kingman county. These glass beads were recovered from 14RP1, a Pawnee village in Republic county. Glass beads from Europe were often used as trade items. 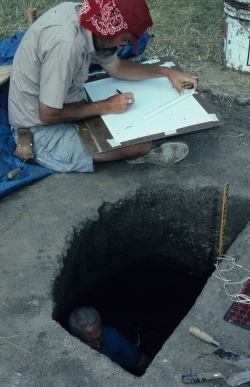 Workers record information during the excavation of a storage pit at the Sharps Creek site in McPherson county at a Kansas Archeology Training Program field school in 1992. Pits like this one may have been used to store food and other belongings. When the pit's usefulness had passed, they often were filled with trash and soil. On the grounds of present-day Pawnee Indian Museum State Historic Site a lodge was excavated in 1966 by staff of the KSHS. 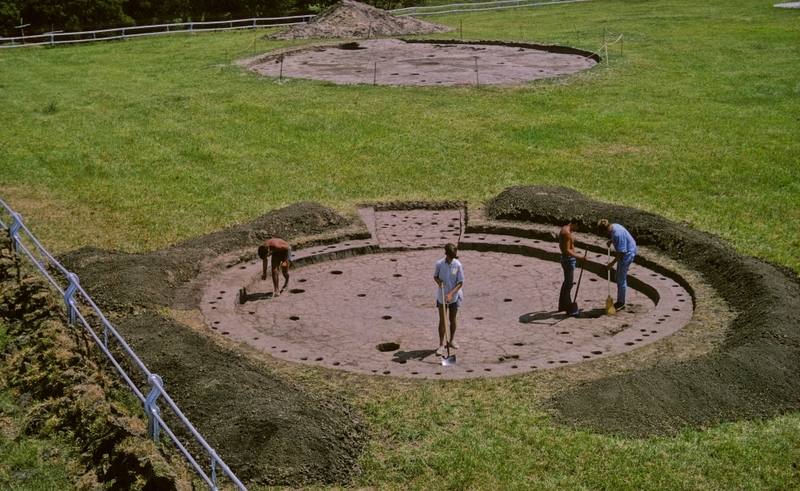 The entryway and the postholes used to support the earthlodge are visible. Another excavated lodge floor is in the background.